Fareed Zakaria says North Korea's missile tests could trigger reactions from Japan and China. (CNN) -- North Korea has test-fired a short-range missile off the country's east coast, a South Korean military source said Friday. It would be the sixth such missile test since the country conducted a nuclear test Monday. South Korean and U.S. forces were placed on their second-highest surveillance alert level Thursday, the joint forces announced. The last time the joint forces raised the "Watchcon" surveillance alert was after North Korea's last nuclear test in 2006, according to South Korea's Yonhap News Agency. North Korea conducted a nuclear test Monday and fired five short-range missiles Monday and Tuesday. On Wednesday, the country threatened military action after South Korea joined a U.S.-led effort to limit the trafficking of weapons of mass destruction. CNN: What do you make of North Korea's nuclear tests? A discussion on how the United States should respond to North Korea's missile tests, on this week's show. Fareed Zakaria: Well, it's a complicated issue, but I do think that we should keep this in perspective. North Korea -- a bizarre, aggressive regime -- is defying the international community and building nuclear weapons. But this is nothing new; they have been doing this for almost 15 years. CNN: So this is being blown out of proportion? 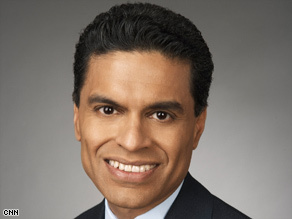 Zakaria: No. The real reason that this is a complex problem is that it could change the basic geopolitics of East Asia. If Japan, which is directly threatened by North Korean missiles, decides to go nuclear, that would trigger a strong reaction from China and could mean the start of an arms race and associated tensions in the region. In fact, some think that it would be in America's interest to have this happen, because it would finally scare the Chinese into acting. CNN: So why aren't the Chinese acting yet? Zakaria: They are in a difficult position. Ambassador [Charles] Pritchard, who worked on the North Korean issue with both the Clinton and the George W. Bush administrations, is on our show this week. He says, "For the Chinese, the significant events in Northeast Asia would be instability along their border with North Korea. "That, above all else, drives their national security interest. The idea of an implosion or a North Korea that simply ceases to exist in a controlled fashion frightens the Chinese." CNN: Why is it so frightening to them? Zakaria: Think of the number of refugees that would flood into their country. There would be a huge impact on their economy -- at a time when the entire world is facing economic problems. They don't want the added challenge. CNN: So the U.S. has to write off the hope of getting any assistance from the Chinese? Zakaria: No, we can't completely do that, because they are the ones who currently have the most leverage with the North Koreans. Selig Harrison -- another guest this week who has visited North Korea 11 times -- argues, "The Chinese want to make sure that North Korea survives. "They don't want a unified Korea in which the United States has bases next to their border, so they're trying to make North Korea as economically dependent on them as possible." He says what we must do is find a way for the United States to offset China's influence in North Korea. CNN: How does the Japan side of this play out? Zakaria: If Japan feels its security is threatened, the nation may pursue nuclear weapons. This would probably cause a domino effect. Other countries in Asia -- that have been dominated or invaded by Japan -- would probably have an allergic reaction to a nuclear-armed Japan. CNN: Should we be worried? Zakaria: None of this is happening yet, I'm not predicting it will happen, but that is what is at stake and the reason we need to watch and manage this situation carefully. I will also have a very interesting conversation with former Secretary of State Henry Kissinger to get his unparalleled wisdom. His response to those who say that North Korea is just blustering here: "To say that a government that monomaniacally focused on this one weapon will then not use it in some way, is an illusion". So tune in Sunday to find out how Dr. Kissinger thinks the world should deal with the North Korean problem. I hope you will get a chance to watch and tell me your thoughts.